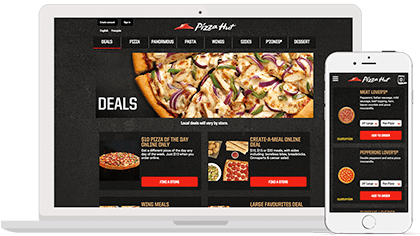 Tap into more sales with our online and mobile ordering solutions. Specially designed for multi-unit restaurants, our platform delivers a consistent experience for every customer, every time, regardless of channel or device. And because we integrate with most major POS systems, getting started is an operational breeze. Serve up a seamless online and mobile ordering experience. 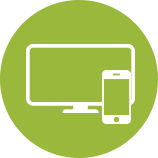 Our User Experience experts design fully-branded mobile apps and responsive websites that maximize conversion and sales. Expand your reach across the web. We’ll post links to your ordering website on the most popular restaurant review sites, search engines and mobile apps, so new and existing guests can order wherever they find you. Increase check size by adding customizable upsell and cross-sell rules to your ordering flow. Our predictive technology will do the heavy lifting to help get the most out of every order. 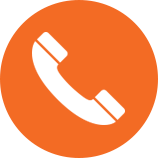 Dial up orders and customer satisfaction with our domestic and international call center services. Our optimized order flows, deep restaurant industry focus, and multilingual capabilities maximize the value of every call. We make delivery a snap, even if you don’t have drivers. Our delivery solutions work behind the scenes to enhance your operations, boost order volume, and maximize efficiency. No drivers? No problem. Turn on delivery with the flip of a switch. Our ordering platform comes with exclusive access to Tillster’s delivery network. Customers order, and one of our partners delivers on your behalf. It’s that easy. Manage delivery operations effortlessly. Our platform lets you control when orders get fired to the kitchen, assign drivers to deliveries, and update delivery zones on the fly. Make every second count. We unleash operational efficiency with innovations that speed table turns, reduce wait times and streamline payments. In-store kiosks let customers take orders into their own hands, freeing up staff to focus on food quality and impeccable service. And off-premise kiosks cost effectively expand your reach without growing your footprint. Let them do the hard work for you. Empower guests and turn tables faster with our convenient Pay at Table solution. Guests can view checks and pay directly through your branded mobile app, and servers can focus on improving the guest experience, rather than running checks. Win-win. Improve speed-of-service and access to working capital when you add Mobile Payment on your app. Our flexible platform enables guests to store and use credit cards, gift cards, Pay Pal, and more.